Highland County Relay for Life participants are pictured during the survivor’s lap at a past event at the Highland County Fairgrounds. 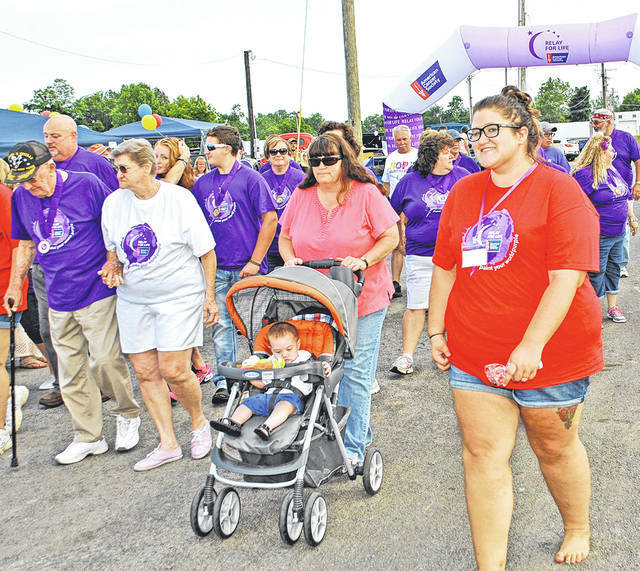 A year after it switched from a two-day, 18-hour event to a one-day, 12-hour event, changes are coming again for Highland County Relay for Life. This year’s 24th annual event will be held from 6 p.m. to midnight on Friday, June 21 at the Highland County Fairgrounds in Hillsboro, according to new co-chairs Angela Moots and Liz Jarjapka. Another change to help offset Mother Nature, Moots said, is that the Highland County Fair Board has given local Relay for Life organizers the option of holding the event outdoors as it has mostly been held in the past, or using the Rabbit and Poultry Barn on the fairgrounds in the event of inclement weather. The theme this year will be Dr. Seuss. In past years Highland County Relay for Life held an annual kickoff meeting each January. This year that is being changed to an open house that will be held from 6-8 p.m. Wednesday, Jan. 16 at the Southern State Community College Patriot Center in Hillsboro. “We’ll be setting up tables representing the different areas of the relay. People can come and roam at their leisure and talk to other people representing each area,” Moots said. She said those areas include one for a luminaria event that people can purchase luminaries for; an entertainment area; general information about the American Cancer Society, what it does for local residents and where the money raised from the local Relay for Life goes; and a survivors area where people can register for a cancer survivors dinner. Moots said there will still be opening ceremonies at the June 21 event like there have been in the past, the survivors dinner, lap events every half hour or hour, relay teams with booths set up offering games, raffles and food, and that each team will be dressed up according to the Dr. Seuss theme. While Highland County Relay for Life raised more than $500,000 in the six years prior to last year alone, proceeds were down a year ago. The goal this year, Moots said, is to raise $75,000. “We’re always open to new teams or people that would like to join other teams,” Moots said. “We just want to spread the word and let people come and see what what Relay for Life is all about. For years Highland County Relay for Life was held from 6 p.m. on a Friday to noon the following day at the fairgrounds. Last year’s organizers changed it to a one-day event held from 11 a.m. to 11 p.m. on a Saturday. For more information on this year’s relay, call Moots at 937-768-6039 or Jarjapka at 937-403-6942.